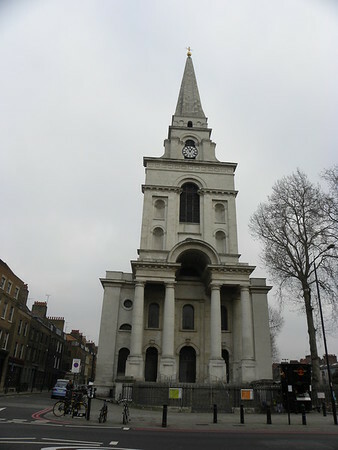 •	Christ Church, Spitalfields was built between 1714 and 1729 to a design by Nicholas Hawksmoor. Situated on in the London Borough of Tower Hamlets, it was one of the first (and arguably one of the finest) of the so-called ‘Commissioners' Churches’ built for the ‘Commission for Building Fifty New Churches’, which had been established by an Act of Parliament in 1711. •	The purpose of the Commission was to acquire sites and build fifty new churches to serve London’s new settlements. This parish was carved out of the huge medieval Stepney parish for an area, then dominated by Huguenots, as a show of Anglican authority. Some Huguenots used it for baptisms, marriages and burials but not for everyday worship, preferring their own chapels (their chapels were severely plain compared with the English Baroque style of Christ Church) though increasingly they were assimilated into English life and Anglican worship—which was in the eighteenth century relatively plain. •	The Commissioners for the new churches which included Christopher Wren and John Vanbrugh appointed two surveyors, one of whom was Hawksmoor. Only twelve of the planned fifty churches were built, of which six were designed by him. •	The church was considerably altered in 1850 by Ewan Christian (better known as architect of the National Portrait Gallery), who removed the side galleries, blocked in the windows at the corners of the central space, and combined upper and lower aisle windows to make tall, thin windows. •	By 1960 Christ Church was nearly derelict and services were held in the Church Hall (an ex Huguenot Chapel in Hanbury Street) as the roof of Christ Church itself was declared unsafe. The Hawksmoor Committee staved off the threat of wholesale demolition of the empty building—proposed by the then Bishop of Stepney, Trevor Huddlestone—and ensured that the roof was rebuilt with funds from the sale of the bombed out shell of St John’s Smith Square, now a concert hall. A rehabilitation centre for homeless alcoholic men was housed in part of the crypt from the 1960s until 2000 when it relocated to purpose built accommodation above ground. In 1976 the Friends of Christ Church Spitalfields, an independent charity, was formed to raise money and project manage the restoration of the building so it could be brought back into use. Church services returned to the partially restored building in 1987 and the restoration of the building was finally complete in 2004. In 2012, the organ and crypt still remain to be restored. •	As part of the restoration process, the burial vaults beneath the church had to be cleared. Instead of hiring a commercial undertaker for this job, the Friends of Christ Church raised funds for the employment of an archaeological team, who excavated nearly 1,000 interments between 1984 and 1986. Of these, about 390 were identifiable from coffin name plates. Archaeologists and physical anthropologists took this opportunity to study Victorian mortuary practices and anthropology, including health and causes of death of the local population. •	The portico at the west end was repaired and cleaned in 1986, when Ewan Christian's re-arrangement of the aisle windows was also replaced by a recreation of the originals. The 202 Ft. tower and spire were consolidated and cleaned in 1997. The south façade was cleaned and repaired in 1999 revealing the striking whiteness and beauty of the Portland stone. At the same time Hawksmoor’s magnificent double flight of steps on the south side, which was removed in the nineteenth century, were rebuilt, in addition, the gate piers of the Rectory yard were repaired and the large iron gates restored. Regency style railings to the churchyard, removed in World War II, were replaced. The north and east façades were repaired and cleaned in 1999–2000. The restoration of the interior, begun in 2000 and completed in 2004, restored the fabric of the church; removed the nineteenth- and twentieth-century alterations; reinstated the original arrangement of galleries and has recaptured the proportions, light and clarity of Hawksmoor’s original design. •	Thus, after years of neglect, the church was restored to its pre-1850 condition, working from the original building documents where possible, a process that stretched over more than 25 years.